Following a minor accident when someone crashed into Gill Arney's car, her first reaction was relief that the dogs weren't in the car at the time. Her second thought was that she needed to rethink the dogs' safety when travelling. At the time, she was still using an old-style harnesses but thank goodness, safety has moved on since then. She looked at the options available in the UK but it wasn't until she was in Europe that she found what she was looking for – the Safedog crate. At the time there was no UK distributor, so after trialling the crate for a year, she was then given the distribution rights for the UK and Republic of Ireland. Of steel construction, the Safedog crates are designed to absorb impact in the event of a crash, offering greater protection to the human and canine occupants of the vehicle. The key to its design is that it’s flexible enough to absorb impact but strong enough to retain its shape and remain intact with the doors closed, thus containing the dog(s) inside the crate. 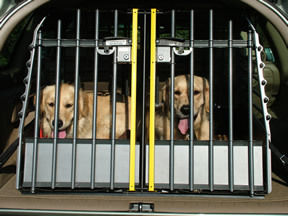 Tailgates are popular, though not as safe as the crates as it may allow the dog to escape through broken windows with the potential for injury. Other crates which were tested proved to be too stiff, resulting in the rear seats collapsing, or being speared by crate fragments, after a rear-end collision. The Safedog range comprises seven crates – two single and five double, which offer options for most estate cars, 4x4s and people carriers. The crates are supplied flatpacked, and the length is variable to suit the size of your vehicle. This is useful if you change your car to a similar size one, as they’re not bespoke. The double crates are supplied with an optional divider, should you wish to keep your dogs separated, and they’re all supplied with integral locks and keys. An escape hatch enables you to quickly release the back of the crate, allowing access through the passenger compartment if the tailgate cannot be opened. A small range of other products are available from Safedog, including crash tested harnesses, universal dog guards and back seat bridges (hammocks) – which can be used in conjunction with the harnesses. I’m old enough to remember the days when we didn’t have to wear seatbelts in cars, and now I can’t imagine travelling in a car without wearing a belt. The same may be said in future years about the way we used to transport our dogs around ‘in the old days’.